Would You Pay $12 a Year to Fight Sea Level Rise? Billions of dollars of infrastructure around San Francisco Bay are sitting in the path of rising sea levels, including homes, roads and tech company offices. And a coalition of environmental and business groups is hoping Bay Area residents will help pay to protect it. “Wetlands are like magic when it comes to protecting against floods." In June, residents in nine Bay Area counties will vote on a new $12 a year parcel tax, designed to raise hundreds of millions of dollars over the next two decades to restore wetlands and build levees. A specially-appointed council, the San Francisco Bay Restoration Authority, voted Wednesday to have the measure placed on the ballot in Alameda, Contra Costa, Marin, Napa, San Mateo, Santa Clara, Solano, Sonoma and San Francisco counties. Each region of the bay would be guaranteed a certain amount of the funding. Scientists say sea levels could rise up to two feet by 2050, inundating today’s shoreline. 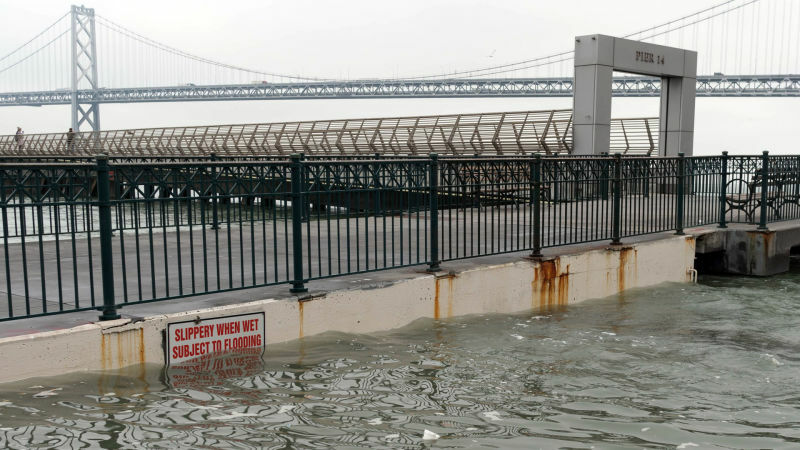 Add to that the flooding from a catastrophic storm, and the damage could cost the Bay Area more than $10 billion, according to a report from the Bay Area Council. How much seas will rise by the end of the century depends partly on what we do to mitigate global warming; scientists say the range is from 17 inches to 66 inches. Add to that a storm surge of more than three feet, and we could end up with waves crashing in 8 feet higher than they do today. This map showing what 8 feet of sea level rise would mean in Bay Area counties is from the San Francisco Public Press' 2015 summer cover story. About 90 percent of the wetlands around San Francisco Bay have been lost, with many diked off and filled in as communities around the bay expanded. About 30,000 acres are awaiting restoration, Lewis says. In the South Bay, some 15,000 acres of former are being restored, but the project still needs millions more in funding. In addition to restoring wildlife habitat, wetlands and levees could protect important roads, highways, wastewater treatment plants and even tech companies. The headquarters of Facebook, Google, Cisco and more than a dozen others sit right on the bay’s edge. Supporters of the measure will have to make that case to the entire Bay Area, including residents who don’t live next to the bay. “Even if your daily commute doesn’t take you near the water’s edge, if there’s a significant problem on the roadway because of flooding, that is going to impact you, because people are going to change the way they get to work and commute,” says Mielke. The $500 million from the new parcel tax is only about a third of what’s needed to restore more than 30,000 acres around the bay. The parcel tax measure needs a two-thirds majority to pass, not within each county, but across all nine counties where residents will vote.